Although I have lived here for a number of years now, I still regularly encounter things that remind me I am far from my childhood home. Some of these things are less than delightful. Such as the Shelob-sized spider I found in the kitchen sink the other night. It was, in all honesty, the largest spider I've ever found in any place I've ever lived. I hate spiders. And I am not crazy about living in a place where people occasionally find tarantulas (oh god nightmares tonight la la la go to your happy place Ian la la la). Another thing that's less than delightful? Chamisa. 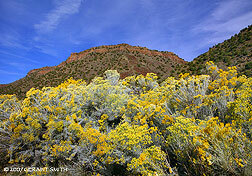 More specifically, that species of rabbitbrush known to botanists as Ericameria nauseosa (formerly Chrysothamnus nauseosa). But I don't know anything about taxonomy or botany. I don't know it by its Linnaean classification, or even as a member of the Asteraceae family. I know it as "that big bushy plant with the stinky yellow flowers that bloom in the early autumn." Chamisa is widespread in the arid American southwest, or so the Internet tells me. I know I see it very commonly in New Mexico and Colorado. I've come to associate it with New Mexico. In fact, nothing says New Mexico to me like the sight of a rocky landscape with mountains in the background and jumbled stands of juniper, piñon, and chamisa in the foreground. Sometimes I'll see a landscape like this in the background when I'm watching a movie, and I'll know it was filmed in or near New Mexico. The plants can get quite large. Large enough that they require regular trimming, otherwise they'll start blocking your garage door and shoving people from the sidewalk. And from a distance they're quite pretty, especially when those golden flowers are in bloom. From which it received its earlier Chryso. appellation. I can't argue with that one. Nor can I argue with the designation nauseosus/nauseosa... which apparently mean "heavily scented." Well, no, I take that back. I can argue with that designation. I argue with it because it doesn't mean "stinks to high heaven", and thus misrepresents the nature of the chamisa plant. A chamisa bush in full bloom exudes the eye-watering mélange of overripe bananas (or really cheap banana scented Scratch-N-Sniff stickers), wet sheepdog, and poorly tanned leather. It's revolting. And so alien that I just had to use it in a book. Revolting to me, but moths appear to love it. If I'm coming home right after sunset, during that time of year when the chamisa is in bloom, and the headlights from my car sweep across the bank of chamisa bushes along the drive, the plants will fairly explode with fluttery white moths. It's like a little snowstorm in reverse. Which is all very charming, until a few of them land on me and secretly hitch a ride into the house. Where, undoubtedly, they wait until I fall asleep so they can lay their eggs in my eyeballs. I didn't realize until just this moment that it's impossible to imagine a smell. I can call up bananas and wet dog, and even leather--but not together. I'm not exactly disappointed. Thank you for ensuring that the rest of us will also not sleep tonight. I have to go inspect all of my shoes and seal them in air tight containers now. I didn't realize until just this moment that it's impossible to imagine a smell. I can call up bananas and wet dog, and even leather--but not together. Oh, come on, it's easy. It smells like running down the stairs in the dark and jolting your spine because there's one fewer stair than you thought, mixed with chartreuse, and the sensation of biting a wool sweater. That's what it smells like. Thank you for ensuring that the rest of us will also not sleep tonight. ....Aaaand now I've just realized there's no reason the next thing hiding in my shoe couldn't be that enormous frakking spider rather than a cute harmless lizard. I'm being totally truthful when I saw I already check my pillows every single night before going to bed, because years ago in anouther house in another part of the country I found a spider under my pillow. Never sleeping again. I agree on the Chamisa. Pretty at a distance, but what a smell, and this year it's actually affecting my nose. I don't have allergies, but maybe because of the drought the Chamisa has gone crazy. Spiders, like coyotes, eat pests. They're useful. Not black widows or brown recluse spiders, but your run of the mill spider is your friend. And just remember -- they're as scared of you as you are of them. When I was a little girl I knew a couple of teenage brothers with a pet tarantula. They used her to scare away the icky girls who were bugging them. I was a tag along tomboy, and since I'm not scared of spiders, and Molly was kind of sweet they couldn't get rid of me. Also, I was 9, I wasn't flirting with them. I'd just pet Molly and trot off with them to the next adventure. I certainly wasn't concerned about the possibility of lizards in my shoes. Spiders, though, can hide anywhere. Anywhere! I'm all for the spiders eating the even nastier creepy-crawlies. In that regard, the arachnids have my best wishes. But they don't have to be visible to me in order to be useful. In fact, if I can see them, they're not doing their job. I keep the house clean enough that they won't find food anywhere I can see them :) I knew a guy in high school who kept pet tarantulas. He'd walk down the halls with one stuck to his sweater. It was like the parting of the Red Sea. I kind of hated him for that. New Mexico is a veritable haven for smelly plants and nasty crawly things. A few weeks back, I found a Camel Spider in my house. The co-op service informs me they hitchhiked with returning soldiers on the nearby base and are thriving. I'll take Tarantulas any day, although Camel Spiders aren't particularly harmful either. There's a plant that really thrives near Ruidoso. I'm not sure what it's really called, but the old farts call it Elderigaberry. It's got nasty, sharp thorns, smelly yellow flowers, and excess pollen. Somehow, it's berries make a delicious jelly, so I spent a lot of sneezy summers getting cut up by thorns as I gathered them for my grandma. So, what I think you are saying is that you want invisible spiders. Oh dear god in heaven-- what in the world is a camel spider, and how is it possibly worse than a tarantula? Tarantulas are hairy and they can shoot their hair into your eyes. What is worse than that?!? And what is the New Mexico plant that sorta smells like a skunk? Or is that just my imagination? Possibly an offshoot of the chamisa family? Because I swear there's something that smells kinda skunky. The Camel Spider isn't actually a spider because it has 10 legs, but it looks rather like one. It comes from the Middle Eastern deserts. Google it if you never care to sleep again. They don't do much besides bite (no poison) and look like something from Starship Troopers. As for skunky plants, there are a few. I know none of the technical names for these plants because my family is very folksy, so these may not ring a bell with anyone outside of my home county. Creosote bush is oily and if you get it on you it leaves a faint skunky smell. Then there's some sort of prickly, yellow-flowered weed that smells skunk-like, and there's a plant my grandpa called skunkweed that looks like a fuzzy cabbage. I'm sure you can guess where it got it's name from. Then again, you may have simply mistook a skunk for a bush; they can be very fluffy in a good year. It's probably appropriate after catching up today with your blog and also reading about insomnia (I don't think I've ever had it bad enough to not sleep at all, but lately I've been lucky to get more than four hours a night between being up late doing homework and then not being able to get to sleep thanks to all the other random stress going on...and less sleep only makes it more difficult to do the homework and deal with stress...darn evil circle) that now I'm certain to not sleep after all of my new mental images of large creepy crawlies. I know my deal with spiders is irrational, and because I also know they're helpful I have a policy not to do away with them unless they're in my immediate space. And starting tonight making sure they're not in my immediate space will include checking under the pillows. *shiver* It's probably a good thing that I didn't know about the guy with tarantulas in high school, though I'm wondering if it's possible to have a panic attack now about something you didn't even know about from your past. Or maybe I'm just remembering the ridiculously large (and, as far as my memory is concerned, furry) spider I encountered in the bathroom of an Ireland B&B. Hi Kristie-- It was Tod Ihde in high school, if you remember him. For a brief while he had two tarantulas. I don't remember if he owned them or if he was holding them for somebody else. I distinctly remember leaving Mr. Dressler's room VERY QUICKLY one afternoon when Tod showed up with the little monsters. Sleeplessness is a viscious cycle. No question. I don't know if I knew him, but the name is vaguely familiar. Perhaps I can reassure myself a bit that I never had any need to be in Mr. Dressler's classroom. Except that I've heard that some friends spent all kinds of time there, and I'm still wondering what I missed. Besides the tarantulas. This certainly is one of the most interesting posts that I have seen in the last few days. I would like to share a website "camelspider.org" where you can find lots of useful information about camel spiders. Thanks, Michael! Based on my disgust with spiders and what little I know of camel spiders, though, I don't think there's much chance of me checking out that website :) They might as well call it "mind-shattering-cavalcade-of-Ian's-worst-nightmares.org"